Of all the genres of oral tradition, proverbs are among the most popular. They embody the wisdom of an entire linguistic community and the experience, beliefs and superstitions of many generations. Armenian proverbs have played a significant role in the preservation of Armenian culture, but this unique reflection of a distinctive worldview has hardly broken out of its own community. 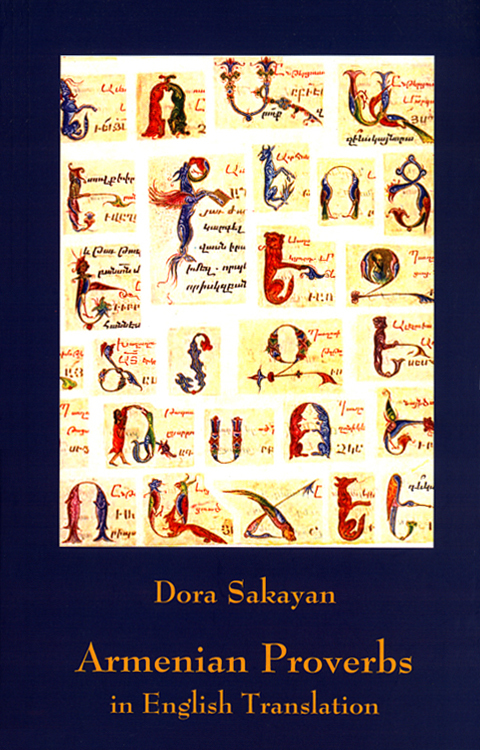 In Armenian Proverbs in English Translation, Dora Sakayan makes the eloquence of thousands of years of Armenian folk wisdom available to the English speaking world, especially to the descendants of Ottoman Armenians who may be out of touch with the national folklore of their ancestors. Organized by theme (Human Relations; Commandments; Family and Relatives; Human Character; Human Nature; States of Being; Beliefs and Superstitions; Country and City; Experience and Education; Injustice, Wealth and Power; and Lessons from Life), the book provides the original Armenian proverb and the translation below it, as well as a clarification if the proverb requires specialized knowledge of the period or social context to be understood. The volume also includes a detailed introduction on the precious socio-cultural information that can be gleaned from Armenian proverbs.